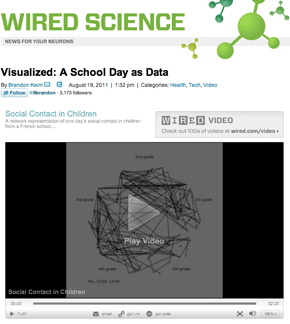 Wired Science: Visualized: A School Day as Data, August 19, 2011. La Stampa, Grande Fratello in ospedale, Novembre 17, 2009, pagina 11. Full-page article on SocioPatterns deployment in childrens' Hospital in Rome. Science, Spreading the flu, May 22, 2009. 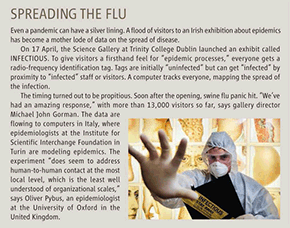 Short article on the INFECTIOUS exhibition in the Science Gallery at Trinity College Dublin, and the SocioPatterns deployment there.